With the snow melted and a warm breeze in the air, there’s no time like the present to clear the clutter out of your workplace. At the end of an arduous winter, small businesses are rife with e-waste, unneeded documents and other office trash. Business owners who want to welcome springtime by saying goodbye to a filthy workplace can benefit from the following tips. Renting a dumpster to house the trash during the cleanup is essential for businesses with a considerable amount of clutter. Not only can a reliable dumpster accommodate old documents, brokendesktop knickknacks and other small pieces of trash, it also makes the perfect waste container for worn-out desks, creaky office furniture and other large items you wish to throw away. Rather than wear out your office’s trashcans and annoy local garbage collectors, a rented dumpster consolidates your clutter. When looking for an affordable dumpster-rental service, business owners can rent dumpsters of all sizes for a wide variety of cleanup jobs. When you find unbeatable prices, you can’t afford not to rent a roll off dumpster. When cleaning your workplace, you’re sure to come across an assortment of old, non-working PCs, monitors and communication devices. This is particularly true for website design companies, cloud hosting services and other tech-themed businesses. Since many electronics contain dangerous metals and harmful chemicals, throwing them away with standard garbage is ill-advised — and in some states, illegal. To safely dispose of your office’s e-waste, collect your employees’ unwanted electronics and drive them to your nearest e-waste recycling center. These Earth-friendly facilities will take apart your old electronics and remove any components that are still useable. If there isn’t an e-waste recycling center in your town, certain electronics chains and office supply retailers — namely, Best Buy and Staples — will take your outdated devices off your hands and send them to recycling facilities. Keeping your business’s computers clean and free of dirt can help them run smoothly and ultimately extend their lives. When spring cleaning, have your employees vigorously spray their computers and PC interiors with cans of compressed air. Next, instruct them to thoroughly wipe down their computer exteriors and monitor screens with nonabrasive microfiber cloths. In addition to being an integral part of spring cleaning, computer-dusting should be carried out at least once a month to prevent the buildup of dust in your office’s most important tech tools. The break room is often the filthiest area of an office. Filled with spoiled food, old coffee grounds and unwashed Tupperware, the typical workplace break room is a veritable breeding ground for mold, mildew and insects. Since employees tend to treat break rooms like their own personal kitchens, the task of cleaning these roomsshould fall to them. Have your staff go through the fridge, dispose of any old foodand scrub with a refrigerator-safe cleaning solution. If your break room has a microwave or oven, have employees wipe these devices’ interiors clean and scrape away any caked-on gunk. As a final measure, mandate that the break room not be used again until all the dishes and food containers have been washed. Businesses buried in unneeded documents should use an industrial shredding service. These unique services, which specialize in destroying sensitive business documents, use industrial-sized shredders to turn clients’ confidential papers into microscopic confetti. If you have piles of old documents, give one of these companies a call. If you’ll soon be upgrading your business’s computer equipment or buying your employees new desks, plenty of places will gladly take any old tech gear or office furniture off your hands. Schools, community centers and thrift stores are just a few of the establishments sure to appreciate a helping hand from a generous business owner. Alternatively, if any employees express interest in taking outdated gadgets or office furniture home, make sure to oblige. As Weekly Living reports, clean offices foster productive workers. 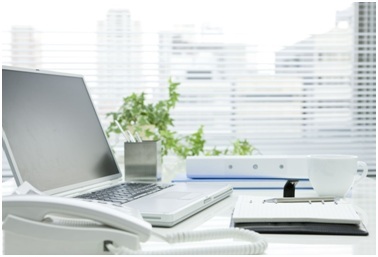 Spring cleaning can be a very ambitious undertaking if your workplace is overly messy. However, after all the dirty work is out of the way, you’ll be able to enjoy the return of warm weather in a sparkly-clean office.